2 cups Fruit puree - You can make your own, but I prefer to use frozen purée for the ease and selection of flavors. Sicoly, imported from Lyon, France, offers 38 flavors of 90% all natural fruit purée and 10% sugar. They are shipped in 2.2 lb tubs, and can be purchased online here. A favorite with professional bakers and bartenders, these purees are also an easy way to make sorbets and exotic cocktails. Cut 2 strips of parchment paper to line the bottom and sides of a 8" square pan. It's helpful to clamp the paper in place. In a medium saucepan, mix 2 cups of fruit purée with 3 cups of granulated sugar. Stir to dissolve the sugar over medium heat. Attach thermometer and bring to a slow boil stirring constantly to prevent scorching. Continue boiling and stirring until mixture reaches 235F on the thermometer, 15-20 minutes. Once mixture reaches 235F, add the pectin and return to a boil. Boil for 1 minute while continuing to stir, add lemon juice and remove from heat. Sprinkle the top lightly with sanding sugar and allow to set at room temperature for several hours, or overnight. Invert the pan onto a board that has been sprinkled with sugar. Peel off the parchment paper. 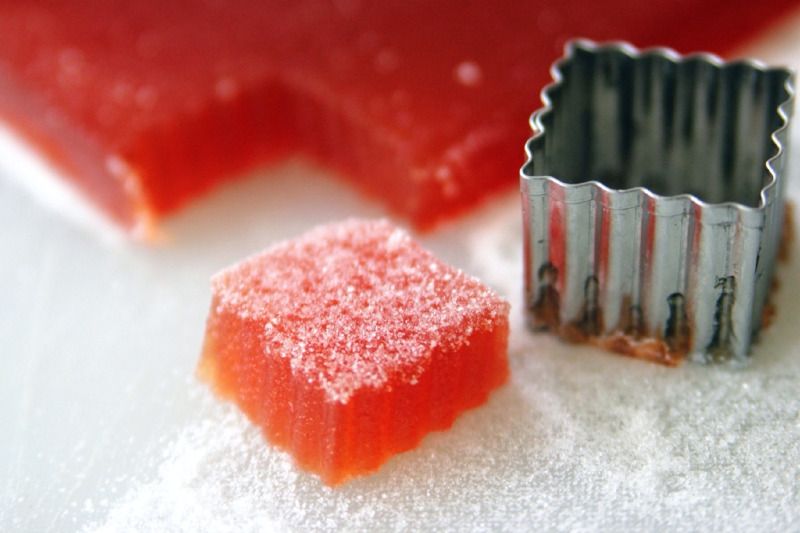 Cut into squares or whatever shape you like, and roll each piece in sanding sugar.